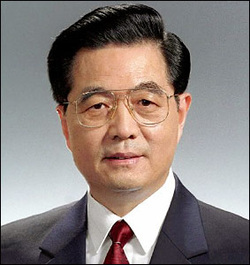 Hu Jinato became the countries president in 2003 and has been the chairman of the Communist Party since 2002("New York times," 2012). 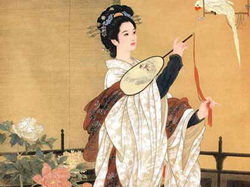 When the Qing Dynasty Dissipated China was in a state of great disarray. China was left with no leaders to rule over the people. Shortly after the warlordism period dominated and lasted from 1916 to 1927. This period was one of the toughest darkest periods for China. In the meantime the ideals of communism began to spread, this system appealed to the majority of the people, especially the lower class. Around 1916 many people started to join revolutionary political groups. They were desperate to change their country. 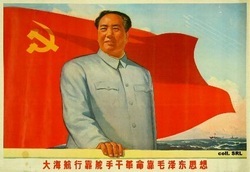 People began accepting the men like Mao Zedong and the communist Philosophies of Karl Marx("Communism in china," 2010). 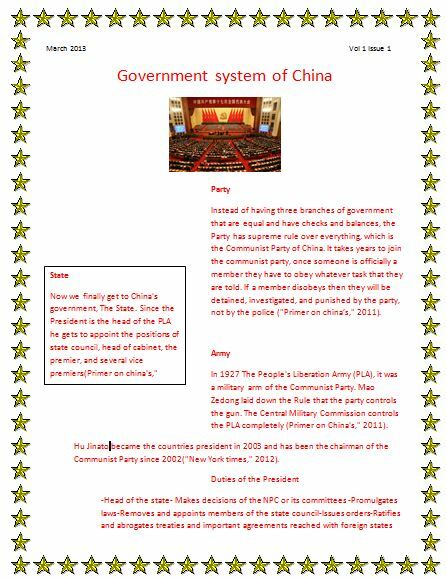 Instead of having three branches of government that are equal and have checks and balances, the Party has supreme rule over everything, which is the Communist Party of China. It takes years to join the communist party, once someone is officially a member they have to obey what ever task that they are told . If a member disobeys then they will be detained, investigated, and punished by the party, not by the police("Primer on china’s," 2011). 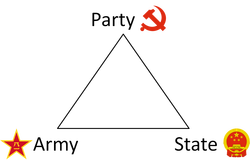 In 1927 The People's Liberation Army (PLA), it was a military arm of the Communist Party. Mao Zedong laid down the Rule that the party controls the gun. The Central Military Commission controls the PLA completely(Primer on China's," 2011). Now we finally get to China's government, The State. Since the President is the head of the PLA he gets to appoint the positions of state council, head of cabinet, the premier, and several vice premiers(Primer on china's," 2011). In 1949 the government made a gender equality law , but there is still discrimination against women today. Even when women have degrees it is hard for them to get jobs. For the most part good jobs are only open for men to obtain. On average a woman that is working the same job as a man will only get paid 78% of the pay that the man would receive. Many rural families will not send their daughters to school. They see it as a waste of money, because she will end up marrying into another family. There is an overabundance of violence against women in China. In some parts of China it is deemed acceptable to abuse wives. Most authorities will not report domestic abuse because it is seen as a family matter, and there are not any laws to protect women from domestic violence("Chinese women's rights," ).